Anthropogenic CO2 increase as the prima facia cause of global warming and climate and weather changes per se is briefly disputed. A very brief review of basic climate drivers is presented. Contrail and aviation cirrus changes are highly relevant in climate change and by a quirk of nature involving changed solar irradiance, lower geomagnetism and more GCR and/or aircraft design they may now actually be cooling rather than warming the climate. Their ability to show up in infra red satellite images may proof to be essential tool in future geo-engineering efforts harnessing steered AGWS. Ironically, on the other hand there is a danger that anthropogenic infrasound sources such as, for example, wind turbines may actually be warming the climate by action in the ionosphere. It is seen as imperative that climate scientists come to understand the global electric circuit and in particular the unsung concepts of Rydberg ionospheric microwave generation, electromagnetic Ozone control and AGW modes. All are critically important modes of energy coupling of ionosphere to lower atmosphere and lithosphere coupling and some AGW coupling in the reverse sense to what they are used to. Subtle AGW modes may be driven from the magnetosphere and liable to anthropogenic modulation. In chaotic weather systems even tiny changes in downward propagating AGWS might impact jet streams, cloud formation and general weather systems. A possible issue is raised which is that AGW modulation may already be unintentionally be occurring a result of our 50 and 60 Hz power systems and as a result of upward propagating wind turbine infrasound. Ionospheric heaters like HAARP, EISCAT and SURA might one day be able to be used in beneficial geo-engineering both for factors such as microwave induced cooling hydrology management and weather system steering. There are few on our planet of whatever persuasion either scientists or lay people who would deny that there have been recent dramatic changes in the world’s climate and for that matter their local weather. For example 2012 has just been declared Britain’s wettest year ever . What remains in much stronger dispute is to how much such changes are representative of a global warming trend, whether such warming ,if any, continues or has halted temporarily or has permanently ceased and finally, what is the driver of such changes. Also it is required to know is all our recent bizarre weather event and weather patterns simply linked to warming or are there other forces at play. The favourite villain of the peace accounting for all or most of this amidst climate scientists appears to be anthropogenic carbon dioxide. More jovial but equally as probable cows farting in fields has also been muted by some. There are at least twenty dissenting International Scientists who dismiss global warming as being due to anthropogenic grounds . The present author disputes the CO2 hypothesis for numerous reasons. For example, CO2 is a narrower band absorber and the earth is a black body radiator. Furthermore, most of CO2 absorption spectra overlaps that of water vapour which has the potential to be a greenhouse gas some 350 times stronger than CO2 yet is rarely mentioned by traditional climate scientists. Yet furthermore, the present author has recently shown that aviation appears to produce a much more accurate fit as a driver of warming during the period 1940-2000 than does CO2 and of course aviation produces contrails and a special class of cirrus cloud ,. Perhaps the piece de resistance, the UK Met Office have very recently released data indicating that global warming appears to have been on hold for some 16 years or so, whereas the concentration of atmospheric CO2 continues to rise . The present author has postulated  that due to recent changes in aircraft engine design; the nature of aircraft cirrus itself may have changed or be changing. Warming or cooling there are only four real known parent drivers for change. These are anthropogenic change, tectonic change (volcanism and earth quakes) and solar change (luminosity and emissions) and GCR (Galactic Cosmic Ray Events). The main purpose of this work is to point out that there are unsung routes for anthropogenic change which really need bringing to the forefront of the climate debate. Furthermore, that there can only be a proper understanding of climate and weather behaviour if all the processes in the ionosphere and atmosphere and their intimate coupling are appreciated and understood. Climate scientists all too often just focus on parameterised clouds and planetary albedo. If more of a multi-disciplinary approach is adopted it may be possible to see how processes at the ionosphere-troposphere interface influence weather and climate and to develop and possibly even to develop safer routes for geo-engineering if it is needed in the future without having to resort to stratospheric seeding. All energy from the sun and GCR comes into the troposphere and lithosphere via the ionosphere. An almost complete model has been provided by Simoes et al . Figure 1: Ionosphere / Troposphere /Lithosphere coupling model due to Simoes. Climate scientists often point out how anthropogenic greenhouse gas emissions cause or ought to cause warming and how volcanoes might cause cooling by stratospheric seeding. Some are loathe or reluctant to accept that variations in Solar input or GCR’S might be just as relevant if not more so. Then again the sun doesn’t pay tax does it? Recently Voronin and Segei  have brought together a brand new climate model combining the effect of solar irradiance, geomagnetic activity and GCR as triggers and modulators of a microwave radio optical process involving Rydberg atoms in the ionosphere the interactions of all three which appears to change global cloud cover in a manner which elegantly explains global temperature change in decadal and recent times. Maybe Voronin’s hypothesis will also be shown to account for recent changes in the behaviour of aircraft contrails and aviation cirrus too? Warming or cooling aside, one of the strangest behaviours in recent climate change has been the erratic behaviour of hurricanes and cyclones, increased bouts of tornados and the abnormal southerly deviation of the North Atlantic 300mb jet stream. Proponents of anthropogenic carbon warming would explain these anomalies by simply stating that warming releases more water vapour into the environment. The present author would retort that so does aviation in the form of clouds and aerosol which have tremendous potential for warming. But in any event can the level of warming and water alone really wreak the havoc we are witnessing. Or is it AGWS (acoustic gravity waves) which are the vehicle? In any event the present author also feels in order to fully understand these processes a more complete model than the above needs to be developed. Only then will we fully comprehend the complexity and interplay of the processes involved and ultimately how to safely harness them to the benefit of our planet and human kind. Besides the microwave model of Voronin, two-way AGW coupling is thought by the present author to be equally important. Moreover, it has recently been shown that there is a two way propagation of AGWS (acoustic gravity waves between the ionosphere (thermosphere) and TS (troposphere/stratosphere)[9-12] and that these come under strong magnetospheric and solar influence. Furthermore it is known that earth’s power grids significantly influence the magnetosphere [13, 14]. Furthermore there are approximately 20 incredibly powerful ionspheric heaters on earth all doing a similar thing . Furthermore intentional and inadvertent infrasound signals can cause hotpots in the ionosphere , also changing the reflectivity of AGWS. Furthermore there are numerous organisations and countries throughout the world with weather control programmes  although it is not presently known if these intentionally employ AGWS. The author has attempted to add these sources and coupling into the Simoes’ model. The result is shown below. Figure 2: Simoes model modified according to Barnes 2012. Magneto hydrodynamic; IAR = Ionospheric Alven Resonator ( ion –acoustic type wave interactions) and finally, AGW = Acoustic Gravity Wave. Note that the anthropogenic main processes which give rise to clouds and aerosols have also been in indicated including; ships, aircraft and industry (includes agriculture, power stations domestic fuel consumption and all other vehicles). Known methods for modifying clouds and weather have also been included, including; seeding and use of lasers and ionisers. Lasers can now be used to impact weather by creating/diverting lightning (Kasparian et al) . Under the ULF/VLF category in addition to natural sources, known anthropogenic sources have been included including ionosphere heaters both radio frequency and infrasonic types. Under these categories it must not be forgotten that the worlds’ power grids at 50 and 60 Hz via their harmonic radiation might be the most significant of all ionosphere heaters [13, 14]. Natural infrasound from waves and tides, earthquakes, volcanoes , storm systems and the aurora is found in all parts of the atmosphere and gives rise to short period AGWS . Such infrasound may be an important source of heating in the ionosphere [21,22]. Long distance propagation of infrasound form artificial sources has been noted with reflections in the upper atmosphere, see Liszka 1974 . Blanc (1985) has stated that infrasound from whatever source, natural or artificial can produce ‘ionsopheric disturbances by collisional effect.’. As the present author is aware is upwelling infrasound from wind turbines at the blade crossing frequency has to date been totally overlooked yet this may even prove to be a critical factor in climate change. Other anthropogenic infrasound from ships, aircraft and mass transport systems may also have a part to play. As infrasound radiates upwards in the atmosphere the lower frequencies are selectively amplified by rarefaction of the air and may give rise to hot spots in the thermosphere, (Lastovicka et al 2006)  perturb temperature and electron densities by up to 10% (Krasnov and Drobzheva 2005) , cause temperature oscillations in the mesopause (Pilger and Bittner 2009)  and can even generate light and pulsed electromagnetic waves (Aramyan 2008) . If the sound is in the form of a shock wave or impulse then exponential amplification with focusing of the rays at mesospheric altitudes is to be expected. http://asadl.org/jasa/resource/1/jasman/v95/i4/p1830_s1?isAuthorized=no. Wind turbine noise is known to have a ‘pulse like character’ http://www.stephanion.gr/aiolika/Effects_of_the_wind_profile_at_night.pdf it remains to be seen how much if any influence it is having either directly on the ionosphere, hence indirectly on our weather and climate. In general then, from the available literature, acoustic and infrasound may cause similar effects to HF plasma heating [30, 31, and 32]. The possibility of injecting energy from space (satellites) in the form of laser beams or EMR ((microwave) electromagnetic radiation is also shown) . Under EMR we should also consider the natural solar microwave bursts and auroral microwave processes and Rydberg microwave processes stimulated by VLF Heating (Voronin and Sergei 2010) . Most accepted models of ionosphere to lower atmosphere coupling are based purely on electrical coupling involving the global DC and AC electric circuits. What is over looked is the notion of AGW coupling. Simoes has pointed out the notion of upwards AGW propagation during earthquakes and from storm systems. Claerbout (1967) has noted that pressure fluctuations associated with the jet stream (AGW modes) radiate into the thermosphere and are strongly reflected by any temperature gradients present. Temperature gradients might be changed by particle precipitation or by infrasound injection for instance hotspots have been found in the ionosphere in regions where mountain infrasound is present. Based on the above one wonders if upwardly propagating infrasound from wind turbines might cause a similar effect. Prikrly et al have pointed out that at times of high solar wind speed after solar flaring AGWS are also generated in the auroral electrojet and crucially may impact extra-tropical cyclone activity . Such downward propagating AGWS are often associated with a southward IMF. It is very interesting to note that the present author has noted that the magneto-acoustic effect some individuals perceive as the Hum is also associated with such an IMF condition . The Hum seems to have been more prevalent in recent years of climatic change. Indeed Prikrly et al goes on to point out that banding in mesoscale cloud structure appears to be due to downward AGWS and that in the autumn and winters of both hemispheres high level cloud cover shows a small but significant decrease in response to a declining solar wind velocity. Clairemedi et al (1985) have observed a huge bi-dimensional wave structure at the auroral mesopause . For example on similar lines, Bucha and Bucha (1998) have shown a geomagnetic link with climate forcing and atmospheric circulation and Thejl et al (2003) have shown a geomagnetic link to the North Atlantic Oscillation . Solar influences on circulation have also been noted by Georgiava et al.. Lastovicka () has shown correlated effects of geomagnetic storms in different parts of the atmosphere . Danilov and Lastovicka note enhanced particle precipitation during geomagnetic storms  as of particular relevance to their link with weather and climate. Most importantly Courtilliot et al (2007)  notes strong connections between the earth’s magnetic field and climate right up until the commencement of the latest fast warming period circa 1980. Courtilliot has also noted cosmic rays as climate drivers but does not dismiss any other single contributory cause. The present author proposes here that by bringing together all of the above findings and accepting two- way AGW (vertical) coupling into the global atmosphere equation one can begin to see how solar and geo-magnetic influence might modulate cloud and storm formation either directly by wind shear amplification or via changes in atmospheric conductivity and even steer jet streams. This gives rise to a new mechanism for these critically significant processes in climate and weather which may have been previously overlooked. The next question to be asked, is if we accept these geomagnetic processes are so relevant to weather and climate from both perspectives of AGW modulation/generation and microwave modulation/generation are they capable of coming under any anthropogenic influence which could either be relevant in inadvertent climate change seen to date or in any potential future geo-engineering of weather and climate for the better? Guglielmi and Zotov (2012)  have noted just such an effect which they describe as a ‘hourmark’ effect or synchronous influence of the technosphere on the regime of electromagnetic oscillations in the cosmic plasma and on seismic activity. Next, exactly what are the influences concerned? Parrot and Zaslavski (1996)  identify several types of wave influences coming from the earth’s surface towards the ionosphere. Firstly, there are anthropogenic AGWS from explosions, space flight, and aircraft flight, especially supersonic. Next there are electromagnetic waves across a wide frequency spectrum, including those generated by power line harmonic radiation strongly observed by satellite receivers over industrial areas, ground based communication, navigation and ionospheric heater transmitters, the latter purposefully designed to change natural ionosphere and magnetosphere parameters. A large variety of physical processes are observed including wave-wave and wave-particle interactions and particle precipitation and chemical changes due to changes in ionisation. The next question is, at which times and when and which anthropogenic influence, particularly from ELF/VLF sources is strongest? C.G. Park (1976)  notes that ‘manmade VLF noise plays an important role in the post –storm (geomagnetic) of energetic electrons’, i.e. it alters the particle precipitation process, see figure 2. Power line harmonics of 50 Hz and 60 Hz are absolutely ubiquitous worldwide and Park and Helliwell (1978) point out that these disturb the magnetosphere out to ‘many earth radii.’ So climate scientists have been blaming our energy use for climate change viz a viz CO2 but maybe our electromagnetic pollution of the magnetosphere is just as relevant? There are now approximately twenty known extremely powerful (some up to 1GW ERP) so-called ‘ionospheric heater’ transmitter installations worldwide. Perhaps the most well known, although not the most powerful, is HAARP in Alaska, followed by EISCAT in Norway and SURA in Russia. The declared purposes of HAARP are to analyze the ionosphere and investigate the potential for developing ionospheric enhancement technology for radio communications and surveillance. 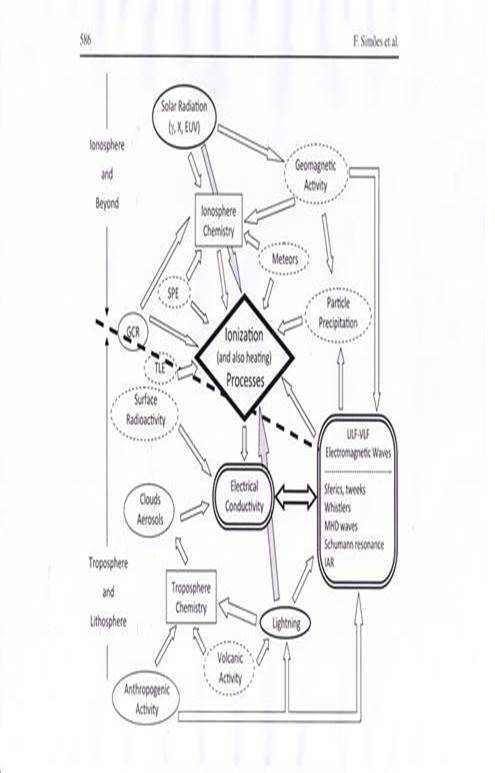 Further stated applications of HAARP and HIPAS [46a] made by Wong (1999) were global communications using ELF, ozone depletion remediation and control of atmospheric CO2. Cohen and Inan (2012)  have in a satellite study shown that VLF signals ‘strongly impact’ the radiation belts and that such trans-ionospheric modification as declared above is happening for at least one known VLF transmitter in the heated region. Indeed form the microwave perspective; Voronin and Sergei (2010) have stated that ‘transmitter work’ might account for 10% of all microwave generation form Rydberg states. World power grid systems are not actively controlled other than in frequency and load management and their influence on the ionosphere and ultimately on weather and climate will be linked via other geo-physical and space weather processes. Unlike the early VLF submarine transmitters, HAARP does not radiate VLF/ELF directly but sends modulated HF waves into the ionosphere, usually but not exclusively the Polar Electrojet, where they produce the former by non-linear processes. Also HAARP was developed with a form of mitigation in mind. But this was not climate mitigation, it was mitigation of another kind to try and provide more efficient radio and military radio communications at times when solar influence would cause huge impracticalities. HAARP, EISCAT and SURA has allowed the generation of phenomenal wealth of scientific results and publications. Whereas the present author has read a great deal of this work just a few examples are required to illustrate the important principals and proposals which need to be discussed here. The first important principal has been documented by Golkowski et al (2011)  and is that under the right conditions systems like HAARP can produce magnetospheric amplification particularly in geomagnetically quiet conditions following a geomagnetic disturbance this concurs with the earlier findings of Park for VLF noise in general. Leyser and Wong (2009) have stated that ‘powerful electromagnetic (EM) waves (of the HAARP kind)  can exert well-defined influence on the atmosphere, ionosphere, and magnetosphere. These active EM interactions can provide spatiotemporal information on the near-Earth space environment (geospace). Objectives include remote monitoring and controlling of a wide range of parameters of geospace, controlling properties of the ionosphere and magnetosphere, as well as interaction with large-scale natural energy sources. In addition, applications such as mitigation of atmospheric pollutants and solar power satellites are discussed. Studies of EM wave interactions also contribute to the knowledge of anthropogenic effects in the geospace environment, such as the increasing use of EM radiation’. Could ionospheric heating ever achieve its stated aims? From a perspective of creating or modifying AGW waves it looks as though the answer is in the affirmative. Perhaps most significantly of all, and proving one of the above sated objectives, Kavanagh et al (2006)  have observed artificial modulation of radar echoes from polar mesospheric clouds under the action of HF heating and deduced the cloud descent is indicative of HF induced gravity wave effects. Regarding microwave generation, this might be expected according to Carlson Jr. (1993) [50a] and certainly the microwave environment of the mesosphere has been noted to change under impact of high power radio waves [50b]. Eastlund and Jenkins [50c] have separate proposals for trying to disrupt the formation of tornadoes by employing microwaves beamed directly from space satellites. Finally regarding Voronin’s hypothesis, this is very new and all the experimental evidence appears to be in the Russian literature and language. There is however lots of evidence that the Sun itself produces microwave bursts correlated with its X-ray emission, for example Parks and Winckler (1996) http://adsabs.harvard.edu/full/1969ApJ...155L.117P. Undoubtedly there is some kind of geomagnetic influence on the microwave environment of the ionosphere as borne out from more than 50 years observations of radio scintillations and more recently on scintillations of the ubiquitous GPS signal (Reggiani 2005) [50d]. If Voronin’s hypothesis is independently verified it will in this present author’s opinion prove to be the biggest singly relevant discovery in Climate Science of Modern Times. Some have suggested a scheme to beam the Sun’s energy to earth for power generation using microwaves as a link. This goes back to the 1970’s http://en.wikipedia.org/wiki/Space-based_solar_power. In the light of the above revelations the author is grateful that the stated completion date for this project is still several decades away. The author has serious reservations about the safety of such projects although concedes that transitory use of microwave beams in weather modification might be very useful. A recent report by Robinson et al (Leicester University) highlights some of the uncertainties but again in the onion of the present author light of Voronin’s work we should look very seriously and cautiously at this. Very recently indeed it has been noticed that the density of atmospheric ozone in a region of intense HF heating depletes on a transient basis during the heating but recovers afterwards, Kulikov (2010). Solar modulated geomagnetic activity has been shown relevant in climate change in recent and decadal timescales http://ro.uow.edu.au/cgi/viewcontent.cgi?article=1163&context=theses. There is conflicting evidence in the literature as to whether geomagnetic effects reduce ozone by depletion or by redistribution, one such example of the former is the paper by de Petris et al (1991) http://adsabs.harvard.edu/abs/1991AnG.....9..381D. Clearly if ozone is reduced either by solar influence, GCR influence or by anthropogenic influence, UV penetration will increase and planetary warming will ensue. describe ozone (associated with airglow) as a ‘tracer of short period gravity waves’. In the mind of the present author it is easy to see how ozone fluctuations can be the producer of such waves. Quite simply put; with temperature gradient comes pressure gradient. These can either be in accordance with auroral flutter or geomagnetic pulsation or synthetically created by HF heating of appropriate modulation scheme. Since human kind’s activities on our planet are having some undeniable influence on our weather and climate and since we have no control over the sun or GCRS it is yet possible the two may combine in an as yet unpredictable way in the future to favourably maintain a status quo or to bring a tendency towards warming or cooling of our environment which could of course be classified as slight, moderate or catastrophic depending on rate and feedbacks. Eastlund (2008)  has discussed the use of narrowband earth or space based microwave beams directly on rain droplets or atmospheric oxygen and atmospheric heating to influence rotating storm systems. Over and above this, the realisation that natural and anthropogenic microwaves generated in our ionosphere (as elegantly explained and experimentally tested by S.V.Avakyan 2010) by might also have the potential to warm or cool the planet by direct influence on water vapour clusters and cloud condensation nuclei depending on frequency is indeed exciting and novel. So new is this model that some may need persuading then they should refer to Klein (1978) on use of Radiant Energy for Fog Dispersal and Carlon (1979) ‘Do clusters contribute to the infrared red absorption spectrum of water vapour). If HF ionospheric heating has the ability to locally reduce ozone this may be essential to do if we find ourselves tipping towards a new ice age or mini ice age (as forecast by Lanscheidt 2003) http://multi-science.metapress.com/content/f524m4271487p0u2/ or even simply to overcome the effects of reduced UV by global cloudiness and ozone emissions due to increases in aviation, the former actually seen to be an advantage by Brunelle Yeung http://dandelion-patch.mit.edu/afs/athena/dept/aeroastro/partner/reports/hartman/brunelle-yeung-08.pdf due to reduced skin cancer but vehemently disagreed by the present author due to reduced vitamin D3 and multiple increases in other cancers and illnesses. In this respect famous Geography scholars Bryson and Wendland http://books.google.co.uk/books?hl=en&lr=&id=Ww3DnCF_KZcC&oi=fnd&pg=PA139&dq=contrails+reduce+vitamin+d&ots=SBFyQaPt2m have previously published work in agreement with the present author. Similarly the realisation that simultaneously using ionospheric heating we may have the ability to tweak atmospheric AGWS and influence the paths of jet streams, and weather systems seems to belong in the realms of science fiction yet it could soon become a reality. It will be also be critically essential to quickly investigate and assess the ionospheric and climatic effects of infrasound from wind turbines which are populating our countryside at an alarming rate. From the theory discussed above it would seem that acoustic signals can augment microwave production by Rydberg atoms active in geomagnetic storms. Possibly then vertically propagating infrasound form the world’s many hundreds of thousands of wind turbines may be having a WARMING effect on our planet? In the mind of the present author this opens up possibilities to employ HF heaters like HAARP and EISCAT etc. 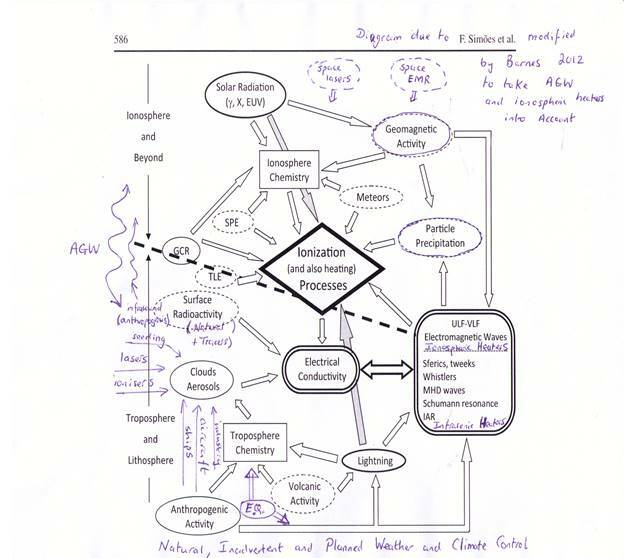 in a purposeful manner to attempt to influence weather and ultimately climate including hydrology by means of AGW interaction on clouds, weather systems and jet streams along the lines of the interactions highlighted herein above. Interestingly, modern aviation could play a part in testing the AGW interaction hypothesis. Modern high bypass turbofan engines with cooler emissions tend to produce more persistent contrails which not only show up on earth but can also be detected in space by infra red satellite technology. The present author has already noticed recognisable patterns such as KH instability and mountain waves in such contrails and aviation cirrus. It is proposed that by purposely seeding such contrails or cirrus to persist for suitably given times in a specific region of the atmosphere of interest could be used as a powerful a probe for the visualisation of AGW dynamics from space or even from earth under clear sky conditions or with appropriately developed radar or lidar systems. It would be then far easier to visualise the effects of RF heating first hand. Of course it may be that such systems are already unknowingly and unwittingly and unintentionally together with PLHR procuring such interactions and in turn these interactions may possibly account for some of the weather we see today. For example, before HF Heaters came on the scene, the only comparable high power transmitters were the Russian HF over horizon radars no longer active and once located in the now Ukriane. When these radars were operational the USA had its worst ever droughts and reversed jet stream flows and the UK had its 1976 record hot summer. Clearly, a lot more research is needed but if successful synthetic RF generated AGW/Ozone/ microwave intervention might be able to be used to mitigate adverse climate effects in a manner which can easily be trialled and turned on and off. This would be in the present author’s opinion a much safer bet than stratospheric seeding which could potentially bring about an ice age or screen out too much UVB radiation. Success of course never comes with guarantee and we should perhaps remember that we would be trying to tease and tame a chaotic system. It may be that one heater working alone is insufficient to cause much effect and international co-operation would most certainly be required in such a project for the fear that otherwise the potential for ‘weather wars’ might ensue. Some non-scientists have already made ridiculous claims particularly concerning HAARP as a machine of terror and mass destruction. Even a speaker in the Russian Duma is alleged to have made a statement concerning the destructive potential of HAARP . Interestingly, however the Russian equivalent of the HAARP system, namely, SURA is thought to emit a considerably greater ERP . If the public domain document ‘Weather as a Force Multiplier’ circulating on the internet is to be believed then the US military may appear to have stated an aim of being able to ‘own the weather by the year 2025.’ Still, whatever, an image of Angels with their hands or wings outstretched is usually associated with Harps and the former are a sign of salvation. Fitting then they are now quite often seen in skies as product of ‘hole-punch’ in aviation cirrus. Are they trying to give us message? HF heating started out as a merely an advanced radio communication technology but might finish up a salvation and solution for our world’s climatic conundrum. Left: hole punch clouds once very rare. The author wishes to acknowledge his wife and son for valuable discussions on the possibility of weather control and also Mr. Peter Van Doorn of the UK Tornado and Storm Research Organisation. 13. Surveys in Geophysics 17(1) pp67-100 1996. 14. C.G. Park and R.A. Helliwell,’Magnetospheric Effects of Power Line Radiation’ Science 19 (200), Number 4343 p727, 1978.